Great DPAC Tickets Are Just a Click Away! DPAC offers many convenient ways to purchase the individual tickets you want to the best Broadway, concerts, comedy, and family shows in North Carolina. Our computerized ticket system enables you equal access to great DPAC seats throughout all the purchase methods listed below. Please watch our short video on the risks of purchasing tickets from unauthorized sources. Great seats are just a click away at DPACnc.com. Enjoy the speed of online purchasing and lock in your seats instantly and conveniently without leaving your home or office. Order online, 24 hours a day with DPAC’s online ticketing powered by Ticketmaster. Tickets purchased on DPACnc.com and Ticketmaster.com are subject to a per ticket service fee, a non-refundable per order processing fee plus optional delivery fees. For ticket purchases with no added fees, please visit us and buy in person at the Blue Cross Blue Shield of North Carolina Ticket Center at DPAC. You’ll receive the best service by calling us and speaking with a specially trained Seating Specialist right at DPAC. If you have questions, we’re here to help. Visa, MasterCard, Amex and Discover Cards accepted. When there is a scheduled performance, phone lines are opened three hours prior to show time and through the start of the show. Tickets purchased by phone at DPAC are subject to a per ticket service fee, a non-refundable per order processing fee plus optional delivery fees. Buying tickets to individual shows? 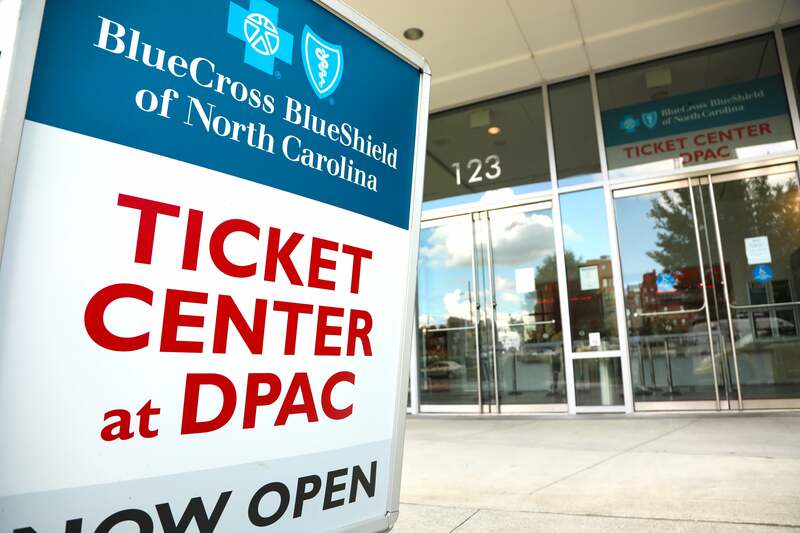 You can save big by visiting our Blue Cross Blue Shield of North Carolina Ticket Center at DPAC since there are never any added charges for tickets purchased in person, right at DPAC. When there is a scheduled performance, the Blue Cross Blue Shield of North Carolina Ticket Center at DPAC is open three hours prior to show time through intermission. The Blue Cross Blue Shield of North Carolina Ticket Center at DPAC is closed on the following Holidays: Memorial Day, 4th of July, Labor Day, Thanksgiving, Christmas Day, and New Year’s Day. In addition, the Ticket Center will close early at 3pm on the Friday before Memorial Day weekend, the Friday before Labor Day Weekend, the Wednesday before Thanksgiving, and will also close at 2pm on Christmas Eve and New Year's Eve. Temporary parking is available on Vivian St directly in front of DPAC. These 15-30 minute spots are free and available on a first come, first served basis. Broadway / Dance Events: Order-by-phone at 800-982-2787. Concerts-Comedy-Family shows: Order-by-phone at 800-982-2787. Groups of 12 or more can save up to 15% for most of DPAC's Broadway shows. Visit our Group Services Page for more information. Gift Certificates are available for purchase at the Blue Cross Blue Shield of North Carolina Ticket Center at DPAC, by phone at 919-680-2787 or online. Redeemable by mail, by phone, or in person at the Blue Cross Blue Shield of North Carolina Ticket Center at DPAC for any DPAC ticketed event based on availability at time of redemption. Mobile Entry is the easiest and safest way to access tickets to events at DPAC. When you select Mobile Entry – your mobile phone is your ticket. For detailed information including guides on how to access your mobile tickets for fastest entry, please click here. The Blue Cross Blue Shield of North Carolina Ticket Center at DPAC and Ticketmaster including DPACnc.com and Ticketmaster.com are the only OFFICIAL TICKETING PROVIDERS for events at DPAC. Tickets obtained from other unauthorized sources may be stolen, counterfeit or invalid due to payment issues and will not be honored. Tickets purchased from other sources are often greatly inflated in price and are not eligible for assistance if tickets are ever lost or stolen or if the event is canceled or rescheduled. DPAC is not responsible for tickets purchased from other sources. Please note that all guests require a ticket, regardless of age. Children under the age of 6 are not allowed at most DPAC performances including Broadway, Concerts, and Comedy shows. Children must be able to sit quietly in their own seat without disturbing other guests. Some shows make further age appropriate recommendations, and DPAC will provide those on its website; however, parental discretion is always advised, and judgment of the content for each show should be made on an individual basis prior to purchase. When available, DPAC provides links to show websites for further information and recommendations. As a further courtesy to our patrons, DPAC recommends one parent or chaperone for every one child in attendance. This policy does not include special kids shows such as Disney Live, Wild Kratts, Paw Patrol Live, and Peppa Pig.